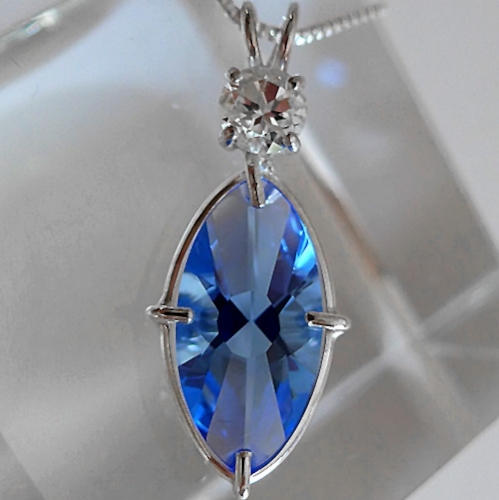 Dimensions (HxWxD): 1.4" x 0.5" x 0.25"
This beautiful, natural untreated Siberian Blue Quartz Infinite Eye pendant with round White Topaz crown comes with a sterling silver chain in a velvet jewelry box. This amazing new pendant, cut according to principles of sacred geometry, resembles the legendary Eye of Shiva. 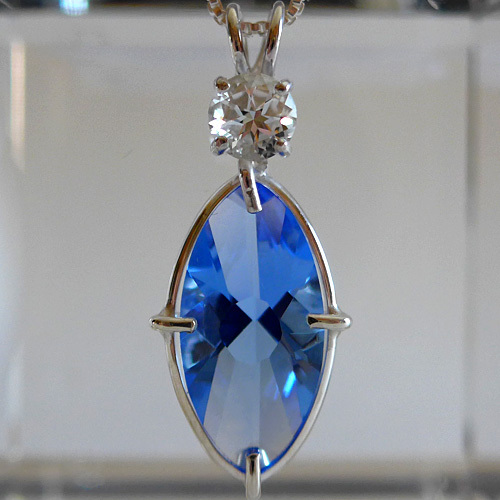 Created to gently encourage our inner vision, this pendant, composed of water clear, natural, Brazilian quartz and gemstone quality white topaz carries a high-frequency energy signature! It is set into a simple sterling silver setting which allows the stones to breathe and comes with a sterling silver chain which will sit upon the thymus, between the heart & throat chakras, where it will be of the utmost benefit. Note: Weight above is shipping weight. Net weight of this pendant is .15 ounces, or 4.3 grams.